BAGHDAD, Iraq (CNN) -- A suicide truck bombing in the northern city of Tal Afar last week is the deadliest single attack since the Iraq war began in 2003, a high-ranking Iraqi Interior Ministry official said Monday as a new death toll for the blast surfaced. The Wednesday attack -- in which a truck packed with 4,000 pounds (1,814 kilograms) of explosives detonated in a Shiite area of the city -- was initially blamed for 85 deaths, according to an Iraqi army officer in Tal Afar who estimated the death toll Thursday. Hundreds of others were wounded. But the Interior Ministry official said Monday that the death toll was 152, making it the war's deadliest single attack. In a separate and apparently retaliatory attack, gunmen stormed homes in a Sunni area of the city, killing 70 people and wounding 30, according to the army officer. Forty others were kidnapped. Before last week's attack, police said a November 23 string of car bombs in Sadr City, a Shiite slum of Baghdad, was the war's deadliest single attack. At least 138 people were killed and more than 200 were wounded when six car bombs detonated there, Health Minister Ali Shammari said in November. In closing arguments Monday, Iraq's chief prosecutor, Monkith Alfaroon, requested the death penalty for Ali Hassan al-Majid, who is accused of gassing thousands of Kurds in the 1980s. Alfaroon also sought the death penalty for four of al-Majid's five co-defendants. It was not clear if Alfaroon wanted the death penalty for the fifth defendant. Alfaroon asked for the most severe penalty for al-Majid, Sultan Hashem Ahmed, Saber Abdel Aziz, Hussein Rashid and Farhan Jubouri "because they committed awful crimes and they never had mercy for a woman or a child." "Even the environment suffered from their tyranny and injustice," Alfaroon said, according to court proceedings on Iraqi state TV. Al-Majid, aka "Chemical" Ali, is the cousin of former Iraqi leader Saddam Hussein and a former senior member of the regime. He faces genocide charges for his role in a military campaign called Operation Anfal. He was governor of the region at the time and is accused of ordering the killings of as many as 100,000 Kurds in 1987 and 1988, as the Iran-Iraq war was nearing its end. The Anfal trial began August 21 and included genocide charges against Saddam Hussein. The Iraqi leader, however, was executed December 30 after being found guilty in the 1982 killing of 148 people in the Shiite town of Dujail. 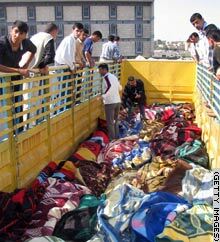 The Anfal trial resumed a week after Hussein's hanging. The remaining six co-defendants, including al-Majid, face charges of war crimes and crimes against humanity. Bombs in Baghdad, Kirkuk and the northern town of Khalis left more than 20 people dead and wounded scores Monday, Iraqi authorities said. Baghdad was rocked by five separate bombings in different districts. Four people were killed and 27 wounded in those blasts, police said. The deadliest of those attacks was in the southeastern part of the capital, where a bomb inside a parked car killed three people and wounded 10, a Baghdad police official said. The blast also destroyed five cars and six shops, he said. A roadside bomb exploded in a crowded commercial district in Khalis, northeast of Baghdad, killing at least 10 people and wounding more than 30 others, a police official said. In Kirkuk, explosives hidden beneath bags of flour in a truck went off near a police station, killing seven and wounding 178. The wounded included police, civilians and several children, a Kirkuk police official said. The former governor of Diyala province was wounded and one of his bodyguards was killed in Muqtadiya, where a roadside bomb struck their convoy. Another five people in the convoy were wounded, a police official in Baquba said. Iraqi police said they found 17 bullet-riddled bodies across the capital on Sunday. The number of bodies found dumped in a similar fashion across Baghdad has decreased in recent weeks and U.S. military officials call it a sign that the Baghdad security crackdown is working. Other police officials said 19 bodies were found in Khan Bani Saad, about 20 kilometers (12 miles) south of Baquba. The victims had been shot in the head, and their bodies bore signs of torture. Iraqi army troops found four more bullet-riddled bodies in western Baquba on Monday. CNN's Mohammed Tawfeeq and Jennifer Deaton contributed to this report. Iraqis search for relatives Thursday amid bodies piled in a truck outside a Mosul hospital following an apparent revenge attack on Sunni areas in Tal Afar.